The EXO RTA Tank comes with a great amount of vape goodies: 2 decks (single and dual coil configurations), 2 tanks (2ml and 6ml), extra 2ml glass tank, 3 twisted wire coils, nuts, cotton, screwdriver, o-rings, and a nice squat drip tip cover. There are a few products I have received which I haven’t had the chance to post a review about; as a prelude to my future product reviews to come, I’d like to start it off with a great RTA that gives you a lot for it’s price. Here’s the EXO RTA by iJoy which I got from HeavenGifts.com and I love this tank! iJoy does a wonderful job in putting the EXO together when it comes to build, performance, flavor and vapor production, and versatility. I can’t really compare it to any other tank out in the market right now. 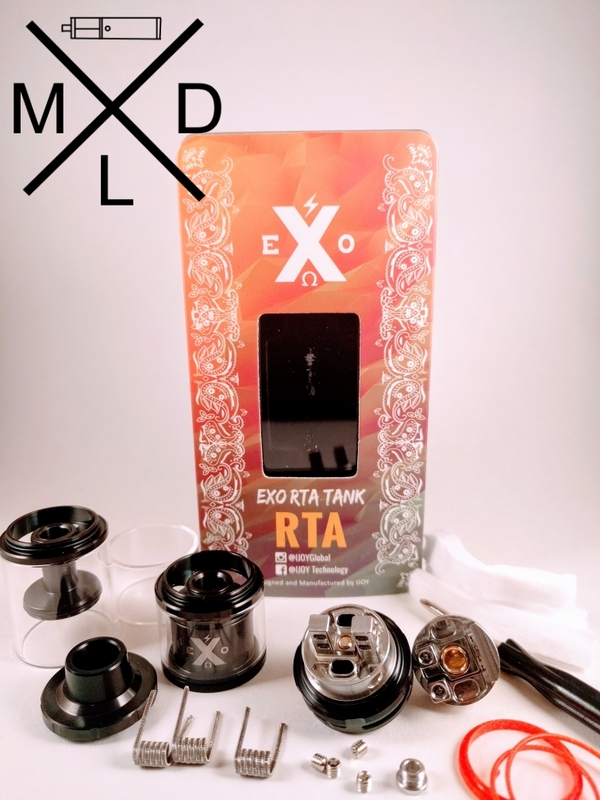 So let’s dive down and get to to know the EXO RTA a little better with this review I did for all of you. Right when I open the box, I’m surprised at how much the EXO RTA has. It’s like a tank kit, your basically getting 2 tanks for the price of one. You are getting A LOT for the price! 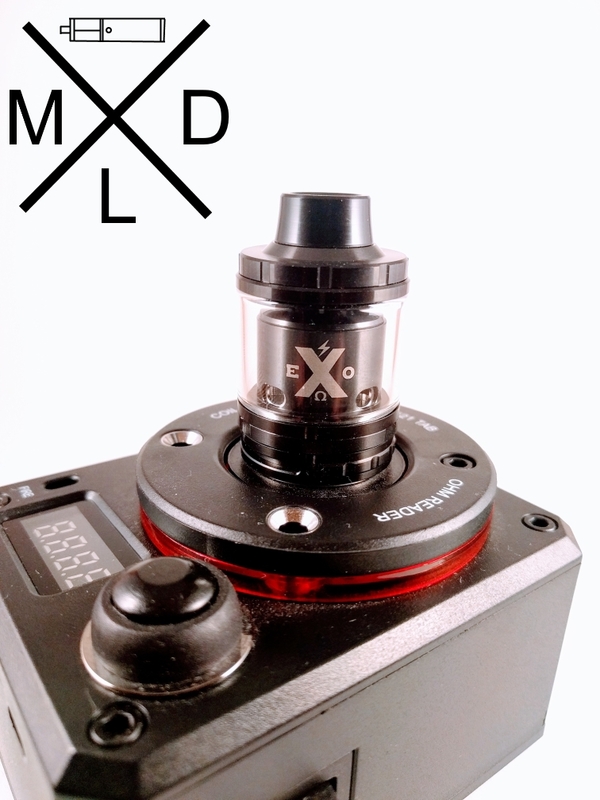 The EXO comes with 4 different configurations: a 2ml and 6ml juice capacity tank, and a dual and single coil deck. It’s a great tank for vapers who like to tinker with their set ups and if you think 2ml isn’t enough, then the changeable 6ml tank should be more than enough for you to enjoy your favorite all day e-juice. iJoy sure did not cut corners when they made the EXO RTA. 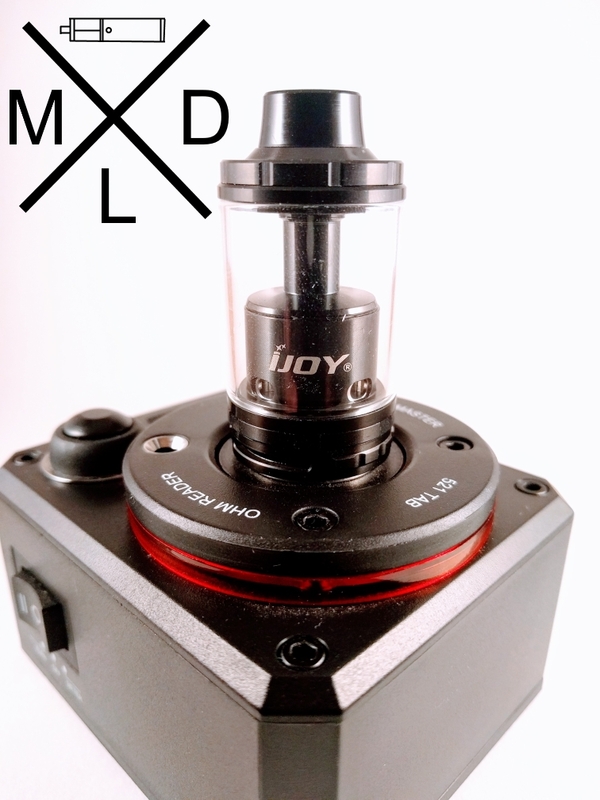 It’s a stout, 25mm wide tank with juice flow control which can handle thick, high VG juice for all you cloud chasers out there. Adjustment on the airflow is smooth and I had no problems moving it around. The draw on this tank is so smooth and just like the OBS Engine Tank, does not heat up even while chain vaping. It’s perfect for a vaper like me who likes tanking long lung hits. 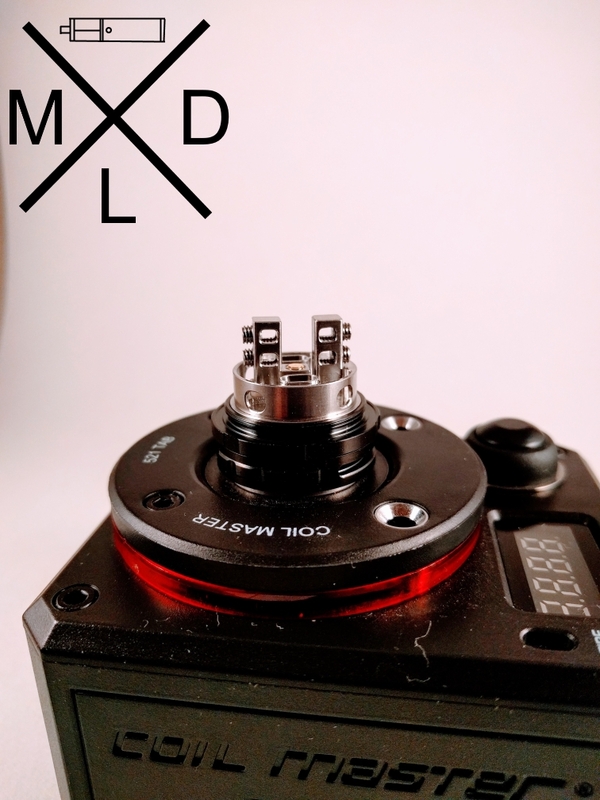 Both decks (dual and single) are well-made to suit thick gauge wires. The posts on the dual coil set up are secured well, and the intake air holes sit right under the coils. The single coil deck’s air intake shot right from the side of the coil. When I was testing them out, they both performed very well when it came to flavor and vapor production. 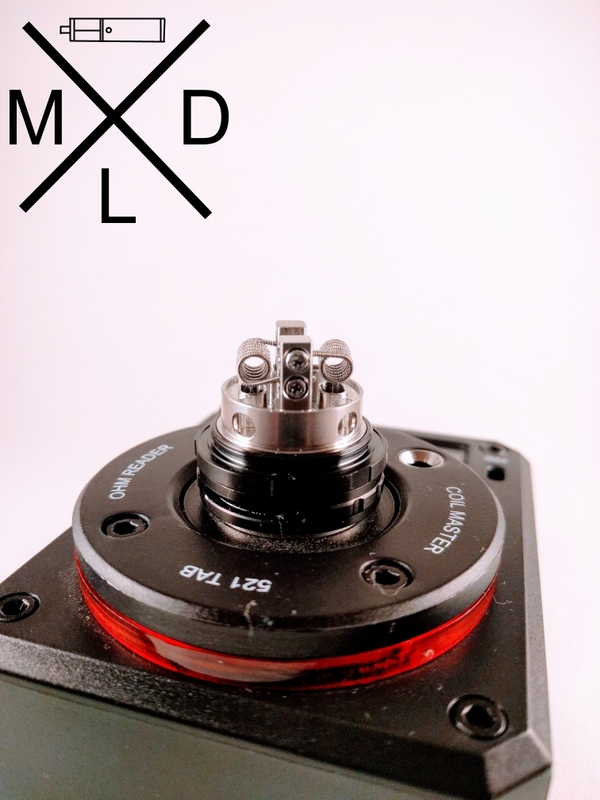 Both decks use a direct contact connector, so it would not be a good idea to use the EXO RTA on hybrid mods for obvious safety reasons. Building on these decks were very easy for me. I installed the stock coils onto both of the decks in a matter of minutes. Not bad for someone who hasn’t tried rebuildable tanks in a couple of months. I’ve been vaping on disposable atomizer tanks for a while now, and I’m not a master coil builder. My coil building skills are a bit rusty, but If I can do it, I’m pretty sure most of you out there can too, probably even better. The decks the EXO RTA comes with is perfect for thick, twisted wire. The big chimney chamber gives your twisted wire set-ups lots of ample room for you to work with. 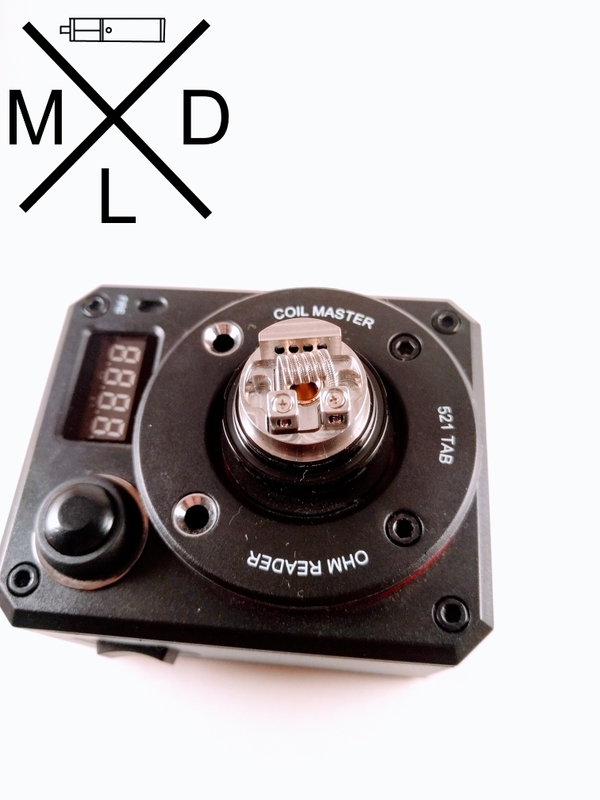 The stock coil that it comes with measures at 0.4 ohms, and I’m pretty sure the EXO can handle lower resistances if that’s what you prefer. Even in single coil configuration, the EXO puts out a lot of vapor, A LOT. I had a really good time blowing humongous clouds of vapor with ease using this tank. The big vapor production brings the flavor of any e-liquid to life. It truly is a sub-ohm tank. One think I hate is a leaky tank. I had no problems with the EXO RTA whatsoever in having to worry about the tank leaking on me. I vaped it sideways, left it lying down. The tank still stays bone dry on the outside. You also don’t have to worry about it gurgling or getting flooded while filling it with e-liquid. I tried refilling it with the juice holes open and none of the juice ever leaked out on me. Even if the EXO RTA looks like a complex tank with lots of features, I found it to be pretty easy to use. For refilling, all you have to do is unscrew the top. 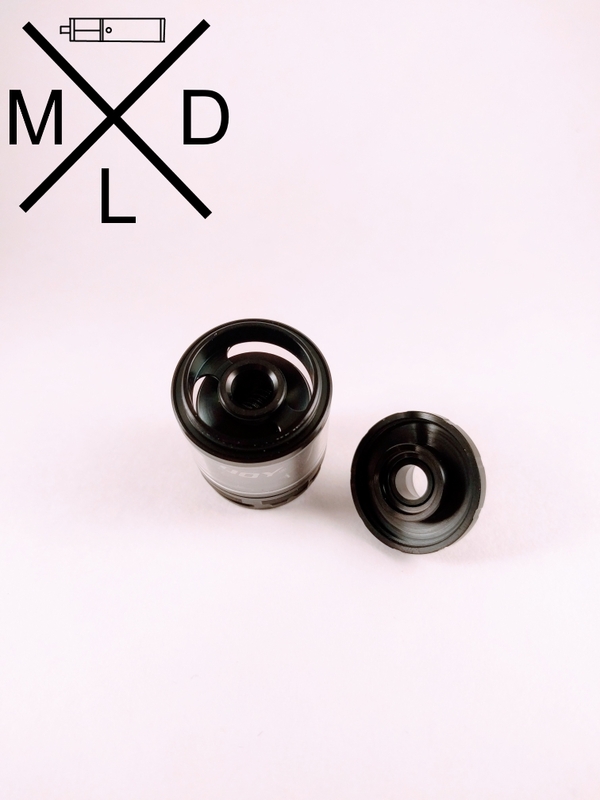 The juice holes are big and you won’t have problems using a typical glass dripper. I heard some people had problems unscrewing the top off the EXO because they would end up unscrewing the glass tank as well and the juice would just spill all over their hands. I’ve never had that kind of problem using the EXO probably because I’m a little more accustomed to these types of tanks, but just a word of caution for those who might run into this problem. Don’t screw the top on too tight. 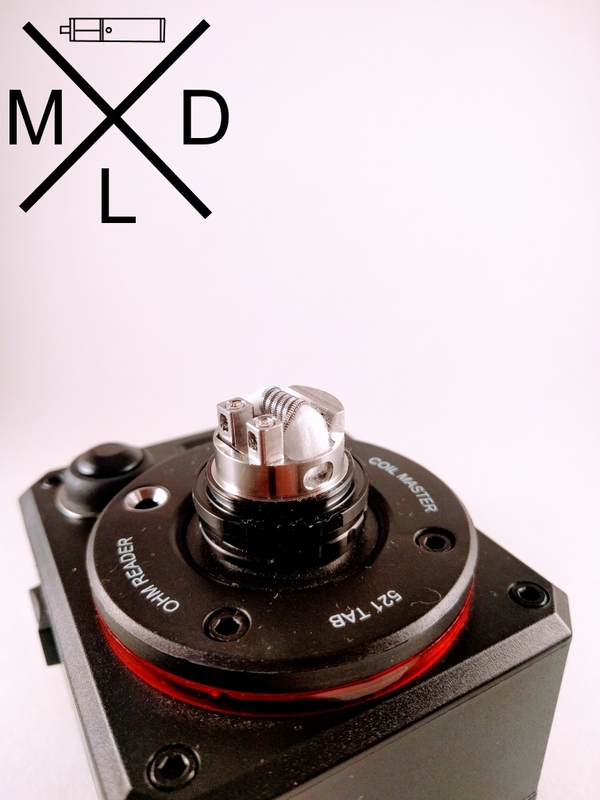 The drip tip it uses is perfect for the EXO as it brings out the flavor a lot, but it also is replaceable in case you would like to slap on another drip tip. For me, the only con I found with the EXO RTA is it goes through juice real quick, especially when using the 2ml tank. I could go through the whole tank in a matter of minutes especially while I’m vaping on e-juice that I really like. The 2ml configuration is not enough to get you through the whole day especially if you vape like me. Keep a bottle of e-liquid handy to keep you going is my suggestion if you are going to use the EXO. All in all, I think the EXO is a wonderful tank that gives it’s user a lot of options. The build and performance is great, and I like the fact that you can change the capacity and coil configuration on the EXO without having to buy another tank. I definitely think it’s a worthy buy for RTA lovers and vapers who are looking for a really good sub-ohm tank that produces a lot of vapor and gives great flavor!